How much would you charge for 2 or 4 of these horn manifold setup ? Sorry, I can't really print these for $$ -- Danley patent, and lazy. You could probably take the STL file (attached, it's for half a horn) to a 3D printing shop and have them do it (but be sure to tell them to use 1mm or 0.8mm nozzle and at least 3 peripherals (and 40% or more infill) to make sure it doesn't buzz or vibrate. Just a little heads-up: a user here was looking to print one of my designs which prompted me to look at prices again at 3dhubs.com. Prices have really dropped A LOT! 2 years ago these priced around $150-200 a piece! Now you can do PLA @ 100um for $29 or better yet, PETG @ 100um for $36! My favorite, SLS Nylon, is still up there at $93, but that is less than half of what it was 1-2 years ago. I think the economics are definitely shifting away from CNC and to 3D printing. That seems artificially low to me, given the time to print a simple wg. I've forgotten the exact time required to print an 8" dia. X 2" deep guide, but it was in excess of 10 hours as I recall. A company with a significant investment in a 3D printer would need to make more than $29-35 to stay in business. Perhaps the printers used for the guides you were quoted are extremely efficient? That's exactly what I told Mandroid when he quoted the prices, seems way low. So I went to check myself and indeed, the marketplace has changed. At least for commercial producers: looking at a recent trade show there are many machines coming out doing 2,6, even 8 prints at the same time. Very happy with this development! Hopefully the laser-sintered nylon comes down more soon, I really like that process. There must be a significant increase in filament flowing out of the heater to speed the time up. They didn't somehow mistake inch measurements for metric, thinking the parts were considerably smaller? Nope, I specifically changed the units to inches since I suspected the same thing. I didn't look to see the vendor, 3dhubs gets quotes from a bunch. How big is your piece? Can you share it? He must have priced Bwaslo's synergy horn. Printing with a 1mm nozzle cuts down the print time by a lot. Compared to the usual 0.4mm nozzle, the height and width double, so if the printer can heat up the plastic fast enough you can expect print time to drop to about (1/0.4)^-2 = 0.16x or about 1/6th the time. Probably about 1/4th might be more realistic, but still it makes a very big difference. And as a side benefit, the prints come out stronger and stiffer as there is more contact between layers and fewer layers overall. A lot of people want to print at higher resolution for appearance, but for audio that makes no sense -- the smallest wavelength we have to worry about is about 18mm or 0.7inch. 1mm of roughness is irrelevant. Oh yeah I don't doubt it...that's a monster. I would be tempted to just buy a Prusa Mk3 and print them your self. Any idea how many hours were required to print each half? For the $800 for two horns, a person could probably make two splash molds for fiberglass inner and outer shells, and possibly recoup the cost laying up a few additional horns to sell. 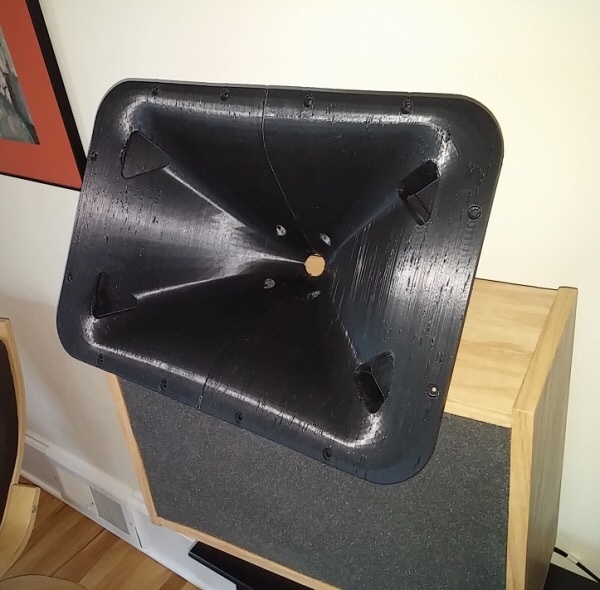 Bwaslo mentioned in his 3d printed synergy thread that the print time was around 13.5 hours per half, 54 hours per stereo pair if nothing goes wrong. It also requires a large format printer. Getting back on topic a bit. Looking at the results for the larger dome Satori and SB tweeters is disappointing; they have such great sensitivity and power handling for domes. I see Revel uses similar large surround domes in their flagship Ultima2 line. Other than the throat starting outside and behind the surround, I don't see any glaring differences. If Revel uses it in their best speaker, surely it wouldn't have glaring top octave issues? 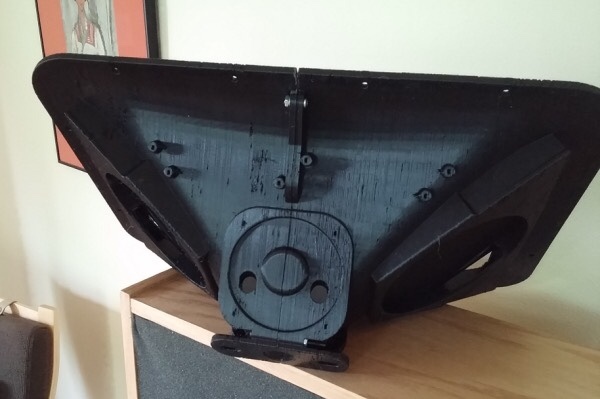 I'm still waiting on my print from 3Dhubs for the 5 inch SD26 waveguide. Status still "printing," which means it won't meet the original expected delivery date. I bought a Folgertech FT-5 R2 to do my own printing. I kind of want to try some different waveguide profiles for the Satori TW29DN-B. Might print a set of Synergy horns too. All times are GMT-5. This page was generated at 03:36 PM.